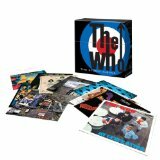 The Who The Studio Albums is an 11-album vinyl box set containing all of the band’s studio albums. Attractively presented with restored original artwork, immaculate sound remastered by longtime Who engineer John Astley, and pressed onto virgin heavyweight vinyl The Studio Albums is the ultimate must-have for any fan of one of the most legendary rock ‘n’ roll bands of all time. Okay, well I’ve had this thing since Christmas, as I was given it as a present. I listened to it on a fairly bad stereo down in Florida, and only this week got to listen to it on my own rig. I’ll agree with the general assessment. It’s a mixed bag. The album covers are very inconsistent: as others have pointed out, “My Generation” is glossy and precise, while most of the rest are matte finish, like the Stones box set, and the cover reproductions are often washed out and cheap looking, like a bad scan. This is particularly the case with “A Quick One,” “The Who Sell Out,” “Who Are You,” “Face Dances,” and “It’s Hard.” The whole thing is based on the UK releases, so little things I thought were errors–like the bright yellow lettering on the front of “Who Are You” or the fact that Record 1 of “Quadrophenia” has Side 1 and Side 2, rather than Side 1 and Side 4–are actually in line with the original UK releases. (The US “Quad” was configured like “Tommy,” with Sides 1 and 2 on record 1, and 2 and 3 on record 2.) The “Quadrophenia” cover finish is the same as on the 2011 Geffen reissue, though the mix is better on this. The inner sleeves are just paper, with no clear rice lining, unless the sleeve is particular to the release, and then it’s heavy cardboard. The “Tommy” cover looks great, with one weird thing: both albums are housed on the far right panel, whereas in all the old Decca/MCA copies I’ve had, record one went in the left panel, record 2 in the right, with the booklet slit under the middle panel. Maybe this was how the old UK album cover was designed: couldn’t determine this on Discogs. Then again, this design makes sense, as the two heavy records on either side tended to result in a tearing of the binding. I’ve seen that happen with old copies of “Tommy.” So no complaints here. The sound. The early records are all great, all the way up to “Tommy.” I have an old Decca copy of this one, and my record 2 sounds thin and shrill, whereas this one is warm and detailed. Conversely, side 1 of my old Decca has more bottom than the one in the box. Not sure if my old Decca is an anomaly: I’ve heard that in most early copies, the two records would have been cut at different plants, so that’s probably what happened here. But overall “Tommy” is a lovely listening experience. And to have it in this lovely cover, with the heavy 180g vinyl and black Track labels, is the biggest thrill this box had to offer me. And it’s a big thrill. I love this copy of “Tommy.” Love it. “Who’s Next” is also fantastic. I think this one was sourced from the Japanese SACD and it sounds like it was. (In fact, this is apparently also the case with “Sell Out” and “Quad.”) The piano on “Getting In Tune” sounds like it’s in the room with you, and the vocals are real and human throughout. Great bottom. “Quad” is great, for the most part, with, as one of the earlier posters remarked, more treble. In many cases, this clarifies the notoriously muddy mix, particularly on “The Punk Meets the Godfather,” “I’ve Had Enough,” and “Bell Boy.” But you don’t get the bounce and warmth of the old version. My old copy is a Track/MCA, very early pressing, and hard to beat, and this one comes close. One place where my old copy wins hands down is “Love Reigh O’er Me.” Here the trebly mix results in a somewhat dry and brittle sound, which is troubling in a song already so overloaded with overdubs and the rest. “Who Are You”: unfortunately, side 1 of my copy seems to be off center. But the sound is comparable, and at times superior, to my old MCA early pressing. “Guitar and Pen” is the stand out here. I did an intense A/B with this track, and the box set version won in terms of detail and dynamic range. “It’s Hard”: This one’s a draw with my Warner Brothers vinyl copy. Got my box in today and I did fault Amazon for the less than secure packaging and shipping of the box. There were outer dings to the box and the corner was split. However I can’t fault them for the inside of the box. All but a handful of the albums are bent and wrinkled…Personally I think the box is too small for the albums. There’s going to be some wear on the covers going in and out of the box because they are a little too “snug”. Paying what I’ve paid I’ve asked for a replacement and Amazon is shipping me one. I hope it’s in better shape than this one. Otherwise, it’s a great concept – all of The Who’s studio albums. Again, I just hope the replacement is in a lot better shape. I play these albums on a tiny small-speaker turntable cranked to the point of distortion, so I won’t bother with a bar-by-bar assessment vs. previous vinyl issues, CDs, etc. They sound quite good, and the packaging is most enjoyable and durable — even acknowledging at least one reviewer’s niggle that some covers are matt, some glossy. Having owned only the mid-to-late-era Who studio albums, it’s great to have them in this format. And Endless Wire is an absolute treat — truly another classic, although it won’t be recognized as such. Of late, I’ve been realizing that It’s Hard is far superior to Who Are You? And considered in toto, The Who’s body of work covers such extraordinary range that the box set is a must to either expose new listeners fully to the band or reinforce their power for diehard fans. Pete’s J-200 flourishes and Rickenbacker edge come through loud and clear, as do all the band’s elements. Perfect timing with the Quadrophenia tour, which is going to go down as the definitive performance of that work and one of The Who’s top five or 10 tours of all time. We owe The Who an immense amount of gratitude, and this box set is a reward for listeners of all levels of devotion. Leave a Reply to editrrr "editrrr"
Chris Brown ban – are we a nation of hypocrites?